Over the years there have been certain cars that have made a lasting impression on all of us whether we’re petrol-heads or not, and it’s these icons that I like to capture when I’ve the time between commissions. ZZ Top’s “Eliminator”, a ’33 Ford Three Window Coupe (often mistaken for a ’34 Ford), is one of, if not the most iconic Hot Rods outside of the specialised world of Hot Rodding. This car regenerated Hot Rodding and introduced Hot Rods to a whole new generation when it exploded onto the scene in the, now classic, ZZ Top videos that were all over MTV in the eighties. The storylines were basically teen fantasy stuff: just some regular guy in a dull job needing a boost in their life is suddenly visited by a trio of foxy chicks in minimal attire, arriving in a mind-blowing hot rod with ZZ graphics down the side. Our hero gets the keys to this hot rod and he emerges as the story’s super stud. All the while the band lurks by the roadside like a trio of Hairy Godfathers. Thus the “Eliminator” became an instant pop icon. When I paint a car from a movie or, in this case a music video, I never just recreate a still from the film, that’d be too easy. I like to create a fresh view that doesn’t exist in the video, my own take on it, otherwise what’s the point really? And that’s where the painstaking research comes in, leaving me choices like which side of the car do I use, what setting would suit the car best, how do I capture the feeling of all the videos without basing it on one in particular etc. I wanted to try and capture a warm early evening with the Eliminator speeding off, it’s work done. Early evening gave me the chance to show the headlights are on, as they always seem to be in the videos. And I wanted to include the band subtly in the background so as not to be corny. I think you can get away with it in a video, but not in a painting. 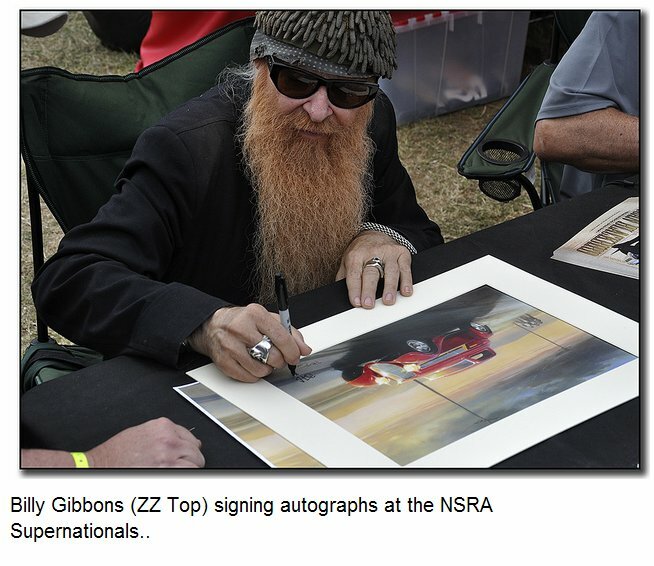 I had the great pleasure of meeting Billy Gibbons at the NSRA Supernats at Old Warden in 2010, where I was exhibiting, and he agreed to sign a few prints taken from my original artwork. He also asked for some of these prints for himself. At the time he didn’t know the Painting was available so he never got the chance to own the Original. And at the risk of name-dropping, I was also fortunate enough to meet famous drag racing artist Kenny Youngblood, the man who designed the Eliminator’s extended “ZZ” logo. It’s only when you really study the car that you notice the graphics are different on each side to keep the “ZZ”s the right way round and not mirror image on one side. It took a while to pick which side worked best.